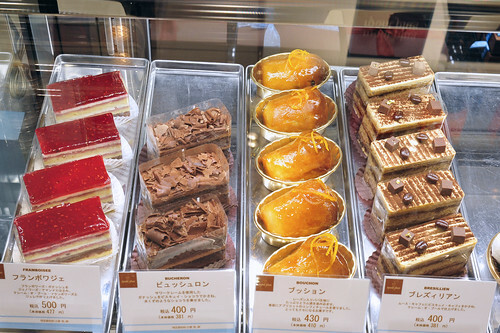 Before our trip to Keikanshin Japan, we did some reading up on the patisseries in the region which are accessible to us. The list was quite overwhelming frankly. But given the time constraint, we had to trim it down to a small compilation, mostly those with takeaway outlets within the depachika of major shopping malls like Daimaru, Takashimaya and Sogo. Jean Philippe Darcis, Michel Belin, Wittamer etc were just some of the international names that had landed in Japan over the last few years. 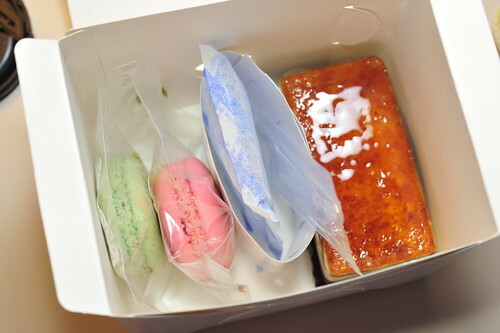 But personally, I’m more keen on sampling creations by the Japanese patissiers. From a recipe book “Monter au Plus haut du ciel” published by MOOK, I learned about Hayashi Syuhei 林 周平 a patissier from Kagawa Prefecture in Shikoku and now currently based in Kobe with his own Patisserie, Mont Plus. The book title, literally meaning “To Reach for the Skies” was very intriguing and so were the creations within. 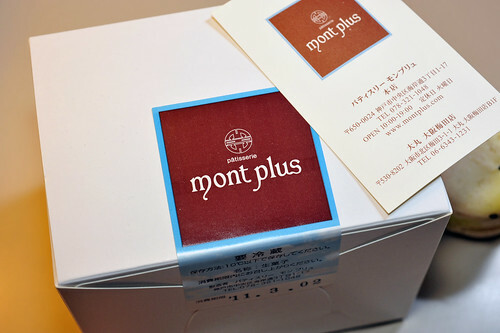 Kobe wasn’t on our itinerary but thankfully, Hayashi san opened an outlet, mont plus PAYSANNE in JR Osaka Station in Umeda. I knew I had to pay a visit to sample his works. 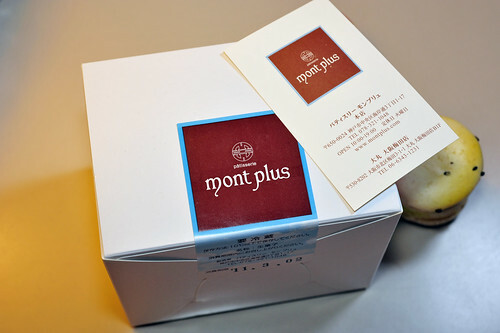 A selection of entremet slices from mont plus PAYSANNE, prices ranging between 400 – 500 Yen. Framboisee, Bucheron, Bouchon, Bresilien, from left to right. Not that easy to take pictures through the glass panel, trying to avoid reflections and glares. I think we recived more glares from the onlooking Japanese customers wondering what these two people were doing trying to take photos while squatting down or kneeling in awkward positions. The Japanese are so meticulous with the packaging. separating the macarons and entremet with a cooling pack cushioned with a ring of cardboard. The weather is biting cold outside mind you, single digit degree celsius along the streets. I was asked if I was going to eat the desserts soon after and when I replied upon returning to our hotel, they promptly set off to pack the confections. 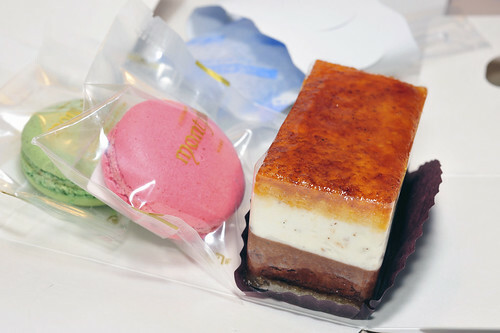 A sticker outside bared the “best tasting expiry” for the entremet while the macarons were individually encased their own plastic bags with the expiry dates pasted on back of the wrappers. I know it sounds much of a cliche by now, but this is really impeccable down to the dribbles of details. 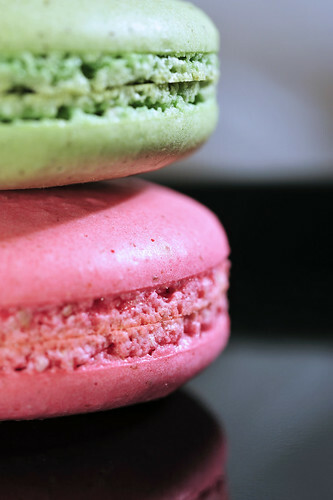 Framboise (raspberry) and Pistache (pistachio) macarons and a simple but elegantly layered “Saint Marc”. Some quick photos using some makeshift kitchenware we bought from a 100 Yen shop near our hotel, a black acrylic serving tray and a couple of dessert forks, which we used throughout the whole trip’s dessert photo shoots. 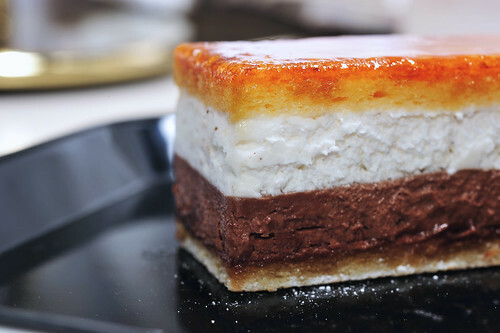 Slates of of Vanilla crème Chantilly and crème chocolat sandwiched between layers of biscuit joconde, the layering of this cake is so well-defined and contrasting. 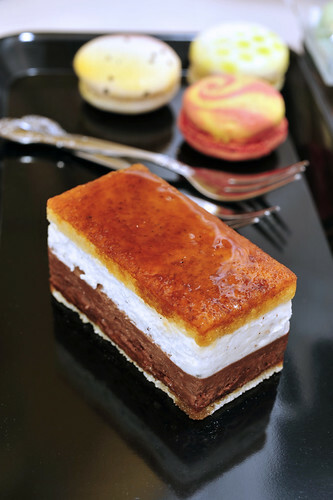 The joconde sponge is first generously applied with a rich custard sauce and sprinkled heavy with layers of caster sugar and icing sugar before being thoroughly caramelised with a Caraméliser to the point of barely charring the sugar. The flavours were as intense as it looked, interspersed with hints of bitterness from the burnted sugar and nectary sweetness from whipped cream, rich yet smooth textures of the chocolate mousse contrasted the crisp crackling of the caramelised shards of crystalline sugar and creamy yet light chantilly cream with the density of joconde. Honestly, the first bite came as a rude shock, owning to the acerbity of the burnt sugar. I’d had many a creme brulees or caramelised meringues before but never had it been taken so far to one extreme. But the other flavours and textures followed suit, sweet, creamy, rich, moist, crisp etc… This is systematic chaos, as each intended character was slowly being teased out one after another, some seeming to compliment while others aiming to contradict, like a prima donna leading the full singing cast appearing from behind the curtains after an operatic climax to receive waves of applause and admiration from their appreciative audience. We picked two macarons out of the flavours, again for good contrast. My initial plans were to try a staple flavour for all the patisseries which offer macarons, and chocolate was the flavour bestowed with this task. But we found this strategy flawed after some rethinking. Given the constraints, we only allowed ourselves to sample what the shop feels is their strength(s), basically asking the shop for recommendations on their best-selling or most popular/welcomed flavour. If we had limited ourselves to chocolate, we would invariably miss out some hidden treasures I’m sure. Its all about “having a cake and eating it”, quite literally. Pistache and Framboise macarons were though offered to us and I’m glad they were. Raspberries had been one of the ingredients which I found so endearing and used extensively in my bakes. Hints of sweet subtleness amidst the mostly tart reality has become almost like a personalised philosophy for me and raspberry is a fruit which carries this so well. The buttercream is soft and lush (as expected) with raspberry compote embedded within breaking the monotony of the sweet coques. Interestingly, the seeds were not removed through sifting. They certainly get in the way of the creamy textures and sometimes stuck between the ivories, but gives the macaron on the whole, a very “earthy” sensation. I know the word sounded weird, but I wonder what’s Hayashi san’s motives for leaving the seeds within. 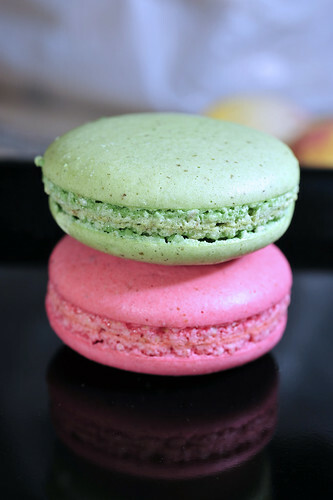 Perhaps we should have tried the pistache macaron first as it probably carries the most delicate taste. Unfortunately, the wrong cannot be undone. 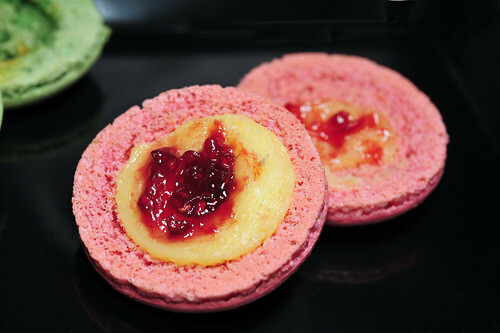 Saint Marc edged too vivid an image on my tastebuds and so did the Macaron Framboise, somewhat. Macaron Pistache was aromatic to say the very least, but that seemed to be the only faint impression I’d had of the green confectionery. This entry was posted on April 19, 2011 by Alan (travellingfoodies). It was filed under Food, Travel and was tagged with buttercream, caramel, 馬卡龍, framboise, Hayashi Syuhei, Japan, kansai, kix, macaron parissien, macarons, osaka, Patisserie Mont Plus, pistache, Saint Marc, Umeda Daimaru, 大阪, 日本, 林　周平. 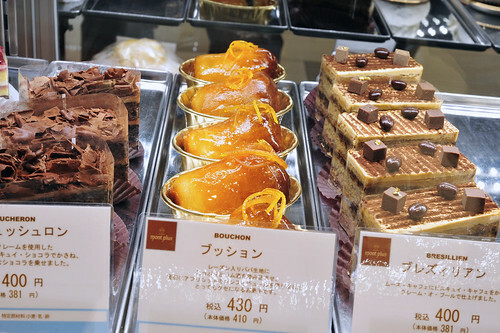 The last time I went to Japan was about a year ago… I was originally planning on going again this month but unfortunately the earth quake/tsunami/nuclear crisis means that I will have to put this on hold… Would have really loved to sample these beautiful treats! 1) are you a writer?? i’m just amazed the way you write. Give me 10years and i will still be not able to write like you. love your writing! 2) are you a perfectionist? you actually bought the props for photo shooting, you’re serious into this, man! 3) so when are you going to bake saint marc?? haha Lena, you are too kind! 1) I’m not a professional writer, though I’d dabbled with some columns and entries for a Taiwanese magazine a couple of years ago but that was in mandarin! :p Moreover, my writing is far from being good, let alone perfect. Raise the bar a bit higher and you’ll be able to spot a plethora of grammar and spelling mistakes! 2) I’m definitely not a perfectionist! but having little props like dessert spoons and serving plates do help with the overall composition of the photos. Moreover, the utensils are no where near Bohemian crystalware quality! Very cheap cos they are from a 100 Yen shop! Alan, I am glad Lena asked you those questions because if she didn’t, I would have, sooner or later. You are very modest to say that you are not a good writer. If what is written by you is not good, what I wrote in my blog will be an embarrassment because you will find tons of grammar mistakes and spellings. If someday, I can write half as good as you, I will be in cloud 9. You may not be a perfectionist but, you are indeed very artistic and creative. Wow, with just props from 100 Yen shop, you can come out with stunning compositions for your photos, I sincerely salute you:D I love your writing, I love your photos and that’s why you will this Quay Po back here again and again. D: hate to say this, but those are the scrawniest macarons I’ve seen in a long time! ah… these are not that bad already. i’d seen worse ones!!! LOL but could definitely do with much more filling, especially the framboise one!